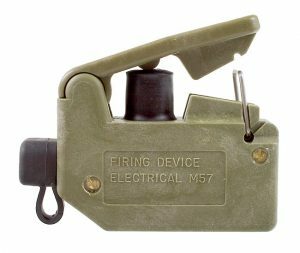 Get Hands-On with the M57 Firing Device at SHOT Show - Mohawk Electrical Systems, Inc. If you never got the chance to deploy the Claymore, now is your chance to test the components yourself by testing the M57 firing device. As a crucial part of safety when using the Claymore M18A1 (and when training using the M68), soldiers must test the components before using them. As a part of the whole system, the M40 electrical test set is used to make sure electrical charge is coming from the M57 firing device (commonly referred to as “the clacker”). This process is to make sure the charge is strong enough to deploy the M4 blasting cap. Mohawk manufacturers, tests quality, and exports the entire Claymore M18A1 system. Mohawk is currently looking to grow market presence internationally. Learn more about our efforts, here. Next Wednesday, we will have the complete inert M68 set, including replicas of the M18A1 and M4 blasting cap. In the exhibit, we will have an M57 and M40 for you to test yourself. Get nostalgic or try “the clacker” for the first time! We will be in the Palazzo Room at booth W1735 on January 23, 2019. Add us to your attendee profile, here. Want a quote or to learn more? Contact us, here. Be sure to grab your own ‘Front Toward Enemy’ bumper sticker at our booth next Wednesday (while supplies last).